Thanks, Dave! Eager to hear and hoping for a good solution for you. If all goes bad, I'd surely contact Tout Terrain and see if they can offer further suggestions or a warranty solution. Well it's sorted but I don't know why. I decided to run the battery through a couple of complete charge/discharge cycles and following that, it seems it will successfully charge an iPhone 6 plus - both whilst taking a charge itself and without. I know that there is no memory effect (though some research differs) on Lithium Ion batteries as opposed to NiCd or Nimh but just thought I'd see whether a complete cycle would have an effect. It seems to have done. Currently seeing how far it will charge an iPhone 6 plus from dead - in theory the batteries are a similar size but with the charging inefficiency will be interesting to see how much of a charge it can give it. So I'm happy but none the wiser! I've seen cables play havoc in this way ... but was the cable the same? Delightful news and outcome, Dave! Thanks so much for the followup. Any updates? How does this compare to their new produce 'The Plug V Plus' which has a cache battery integrated? Hi MrGray; welcome to the Thorn Cycling Forum. My Cinq5 Smart Power Pack II continues to soldier on as before, so no change in my review to date. It has not failed in any way and works as it did when I wrote my review. I don't have the "Plug V Plus" available to test at this time, so I can't make a direct comparison. However, from what I can see comparing the published specs, the battery included with the Plug V Plus has only 50% the battery capacity of the Smart Power Pack II -- 1,500mAh vs 3,000mAh -- so it would completely replace or supplant a non-battery equipped Plug model coupled with a Smart Power Pack II. The onboard battery of the Plug V Plus would seem to be intended to provided uninterrupted USB power during brief stops so gadgets would not reset themselves or require intervention. The doubled capacity of the Smart Power Pack II would allow for much longer stops or riding longer at slower speeds when full USB current would otherwise be unavailable. The Plug V Plus has some other features that set it apart from lesser/earlier versions of the Plug. Among them is a circuit that allows limited charging with lights on, cutting back on the charging function to make sure full drawn power is available for lighting as a priority. Hello readers/users of CINQ5 POWERPACK II. 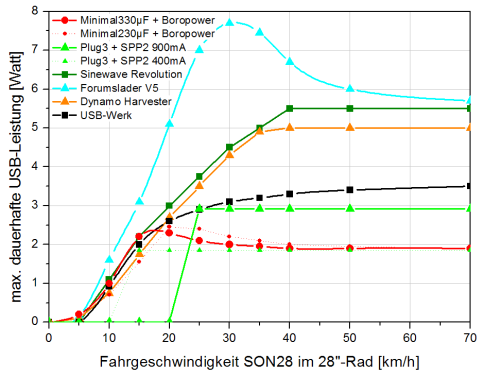 Is the CINQ5 comparable with SINEWAVE REVOLUTION&SON28 dynamo?? Press till Red LED flashes once > Adjust charging current*** > Short press > Charging current adjusted. This was the hardest setting for me to get right. When I remembered to set charging appropriate to the source, all worked brilliantly. When I did not (user error/forgetfulness due to fatigue) it appeared the unit was malfunctioning when in fact it was not. This is where a stick-on guide would really help as a reminder when changing between charging sources. Remember, these are the settings for charging the SPP itself, not for it to power other devices. If this does not correct the charging issue for you, then I would suggest contacting Tout Terrain/Cinq5 and asking their advice. If the unit is still under warranty, they might be able to advise on repair or replacement if it is faulty. Before having the SPP , my SON 28 dynamo and SINEWAVE REVOLUTION reliably charged my iPhone 5s, the only problem being when speed dropped below about 8km/hr charging stopped ( the phone makes a “ding” sound) , then very shortly after above about 8.5km/ hr the phone would start charging again ( another “ ding” to announce that).
. The iPhone 5s never turned itself off with the interruption of charging. Mostly I could maintain 80% charge or more riding 70 to 80 km per day , using the phone for off-line navigation occasionally and brief data usage ( email). The same applies to use of my GARMIN TOUR PLUS GPS. This unit will only reliably charge above about 8.5 km/ hr directly from the SON28 & SINEWAVE revolution . Below that sped the unit constantly switches from navigation to turn off mode. Adding in the SPP provides constant power presumably and the GPS will charge/ function at any speed. I am wondering if what I am noticing is the usual quoted 20% charge loss by dynamo charging a storage battery raither than DIRECTLY dynamo charging the device( phone , GPS etc) is the factor involved here . I'm sure sorry you're having problems with your charging setup; I know it can be frustrating finding the right setup for your needs. Reading your post carefully, it looks like there is nothing wrong with your SON29 dynohub or Sinewave Revolution because as you said, it would reliably charge your iPhone 5S previously except at low speed. Given this, it does indeed sound as if the problem is in your Cinq5 SPP, especially as you have now adjusted it for all three charging rates and have had no success in charging either your phone =though= it or charging it =alone= from your Sinewave Revolution. I think we can now eliminate the phone as problematic because you gave found the same with your Garmin Tour Plus GPS. You could well be experiencing a loss through the pass-through charging, but I can't say for sure in your case. Certainly, there is a loss in charging efficiency charging battery-to-battery. 1) I'd fire off an email to Tout Terrain/Cinq5 and describe your problem. I have found their customer support to be very responsive and they may have an idea. It is possible your unit has failed and if so -- and if it is still under warranty -- they should be able to advise what to do next. Perhaps they can effect a repair or it might qualify for replacement. Their Service page says orders placed through a local dealer should be returned to the dealer. Orders placed online require you fill out a warranty form available here: https://shop.tout-terrain.de/defective-product Once you contact them, you'll know better how to proceed. 3) There is one more possibility: You may have a bad USB cable. It happens that many questionable ones I've later taken apart had cold solder joints or even failed connections inside either the strain relief or where the cable connected to the board or to the connector. You can avoid voltage drop and power loss by using as short a cable as practical; that helps too. I'd sure try a variety of different cables to see if that is a problem. Go for a quality unit like an OEM smartphone unit (i.e. a genuine Apple cable) and see if makes a difference. i gave the cinq5 another try over 110km , and the charge level indicator went from yellow to green ! !, so charging seems to happened, although that was the first time i had seen that [it was used for 2000km after i got it] . , i then discharged the Cinq5[into my phone] to the red charge level , then did the 110km home, charge level went up to yellow , but no further. The reply from Tout Terrain was very unsatisfactory....."So I think the SPP is working fine. I don´t know the SINEWAVE REVOLUTION charger and how it works. Everything sounds ok, up to your dynamo charger. Maybe this is the problem. You can check if the green charge LED from the SPP is flashing in the same rhythm like on the wall charger. If not, the SPP gets not enough power from the charging device." I can't say if your Sinewave Revolution has a glitch in it or not, but I have three different ways to charge things from a dyno hub. Sinewave Revolution, AXA Luxx 70 Plus and a B&M Luxos U, each on different bikes. I find that the Sinewave and the AXA put out comparable power up to something like 20 to 25 km/hour. At speeds higher than that, the Revolution will keep putting out more power, but the AXA seems to have hit a peak. I can't really compare those chargers to the Luxos U because it has a pass through cache battery built in, so trying to measure USB port output at different speeds is meaningless, as the battery is free to discharge or charge while in use. I cited that link with the graph at the following link some time back. I have several digital current meters, similar to the one Dan cited (he listed an Ebay link) and I find that the current flow out of the USB chargers varies quite a lot on these USB chargers when not using a pass through cache battery. They appear to give a new reading about every second and some of those readings are far from what they were during the previous reading. Not sure why, but as long as I see a healthy number of milliamps flowing through it, I will not worry about fluctuating current flow. It might be a function of the power source being a low hertz AC source? You are fortunate that your Garmin will charge without the pass through cache battery. My Garmin (model 64) requires a pass through cache battery for my Sinewave or my AXA chargers to directly charge the Garmin, but the Luxos U has a built in pass through cache battery so it will charge the Garmin 64 fine. I have not used the Cinq unit so I have no knowledge of it. Instead I use some pass through cache batteries that are no longer sold, so I am not citing a brand or model of them. And some of the ones that I have used have quit working. A side note on the Luxos U, the rate that the pass through cache battery in it is charged is of course a function of the ability of the hub to deliver power to it. And some of the newer USB charged devices will draw power out of the Luxos U faster than the power comes out of the hub. When that happens, eventually the pass through cache battery becomes depleted and then the charging out of the Luxos U becomes intermittent as it stops charging your device until some charge is put back into the pass through cache battery, then it starts charging your device again for a few more minutes. When this happens, I unplug whatever I have been trying to charge and let the pass through cache battery accumulate more charge than it otherwise was getting before I go back to charging whatever I was trying to charge. Not sure if this is pertinent to your charging or not. The Luxos U has a tiny pass through cache battery compared to most other batteries, so it is easy to discharge it in use. If your Sinewave will directly charge something without needing a pass through cache battery, you might be better off directly charging the device without the battery in the circuit. As you charge or discharge a battery, heat is generated and that heat was produced by wasting power that was not put to good use. That is the only reason I say you might be better off without the pass through cache battery, as you might improve the energy efficiency of your charging. When I am on a bike tour, I try to keep all my batteries charged up the best I can, so I am frequently checking my charging progress on things. I carry an Android phone or tablet, GPS, battery powered taillights, camera, headlamp (for my head in the campsite), plus spare batteries. I've PM'd you some thoughts and suggestions on your specific charging issues.